If you are new to a Chromebook, you will notice it is not designed like a traditional laptop and one of the first differences you will notice is the keyboard. 1. Where is the Caps lock key? 2. Where is the Delete key? 3. Where are the Function Keys? 4. Where is Home, End, Page Up, and Page Down? Press and hold each key (Ctrl, Alt, and Search; located in between tab and the left shift key) to see the shortcut keys available. The caps lock key has been replaced with a search key. 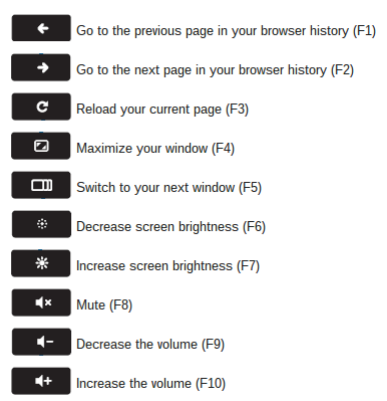 The search key opens the Chrome OS apps menu allowing you to quickly access your apps or search via the Chrome browser. 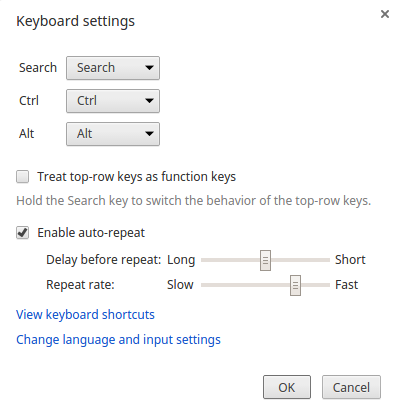 From keyboard settings, you can change the function of the search key to caps lock. Notice you can also change the functions of the Ctrl and Alt keys. ALT + SEARCH - this will enable or disable caps lock. When caps lock is turned on, you will see a up arrow like icon next to the time on the status bar.